In recent years, it seems the food scene has really exploded in Asheville. 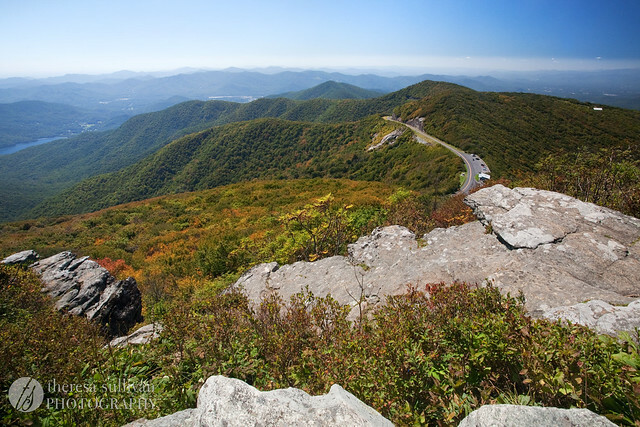 There is a huge array of fantastic restaurants in Asheville to choose from, covering just about every style of cuisine. After spending a week eating my way around town, I’ve decided to highlight a few of my personal favorites in case you ever find yourself in Asheville. Don’t forget to pack your appetite! Disclaimer: What follows is not a paid endorsement or advertisement of any kind. I wrote this without the knowledge or consent of any of the mentioned business and restaurants. I just really love Asheville! Also, I apologize in advance for the poor photos. I took most of them with my phone. It was no accident that we started and ended our trip with visits to Tupelo Honey. Tupelo Honey specializes in Southern food with a twist. We discovered them and their amazing biscuits a couple of years ago. It was love at first bite and I don’t really even like Southern food. Once you have the biscuits, you’ll understand. Instead of pre-dinner rolls or bread, Tupelo Honey brings diners warm, flaky, impossibly buttery (but not greasy!) 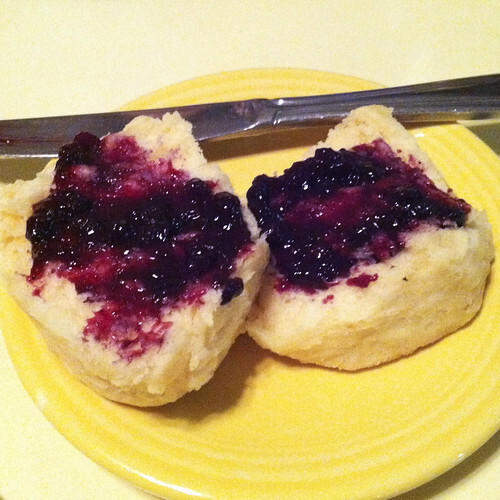 biscuits, with a side of their housemade jam. I’ve declared them the best in all of Asheville. Not to go on and on about the biscuits (although I could). The rest of the food is just as good! On our first visit we both had the special, a garlic and brown sugar chicken with mac & cheese and sauteed greens. I nearly fainted it was so good. I ate until I felt sick. Literally. On our second visit, I tried the scallops. They were perfectly tender and the salty chorizo was a great pairing. You will not leave hungry! If you can’t get to Asheville, no worries. Pick up a copy of the Tupelo Honey Cookbook instead! If I wasn’t so lost for words, I would write a love letter to the French Broad Chocolate Lounge. This place is my idea of heaven. Or it would be, if everyone else hadn’t figured out how great they are and made the place so crowded! Pro tip: If you visit after 5pm Friday through Sunday (and maybe even weeknights), be prepared to wait in line. Possibly a long while. On our last of three (yes, three in a week) visits, the line was out the door (again) and we got a kick out of watching passers by do a double take, followed by the inevitable question, “What’s in there? !” The answer, of course, is chocolate. Amazing, incredible, the best ever chocolate in just about every form you can imagine. Handmade truffles? They’ve got those. Drinking chocolate? Sure, what flavor? Cakes, cookies, creme brulee, brownies, bars, ice cream and more. 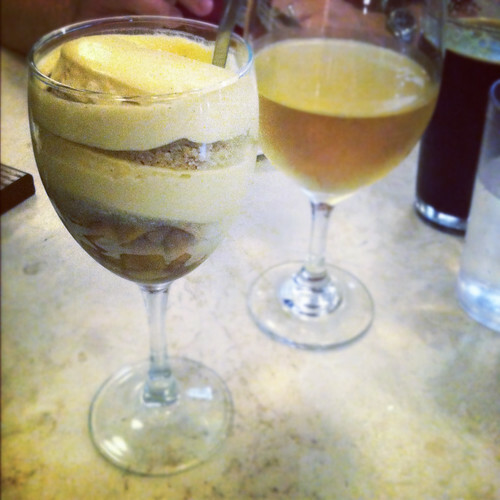 They even have a few non-chocolate things, like the decadent bourbon apple parfait I tried on our first visit. The Chocolate Lounge is set up like a little cafe, so you can order your treats with a glass of wine or cup of coffee, kick back in a comfortable chair and listen to some live jazz music. As if the Chocolate Lounge wasn’t amazing enough, they very recently opened their own bean-to-bar chocolate factory! Sadly, I missed out on the tour & tasting, but you should go on my behalf. Can’t get to Asheville? Don’t worry, you can order from the French Broad Chocolate Lounge online! They ship their goods well-packed on ice, so you can indulge your chocolate cravings all year long. I should also mention that they do chocolate subscriptions. I was lucky enough to be gifted a 6-month subscription for my birthday and let me just tell you – BEST GIFT EVER for any chocoholic. So far I’ve been surprised with a box of truffles and a huge box of brownies! White Duck was a new-to-us restaurant. After hearing high praise from several sources, we decided we had to check it out. I’m happy to report they live up to the hype! White Duck Taco Shop is located in the River Arts District, surrounded by warehouses converted into working artist studios. 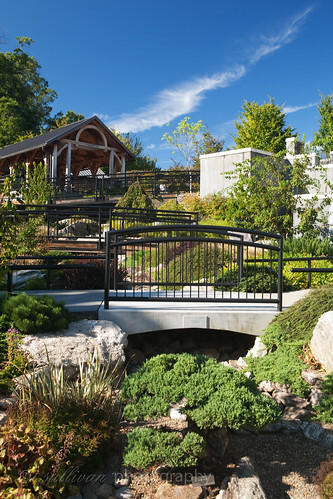 Take some time to walk around and explore the incredible range of art on display in Asheville, and maybe chat up some artists. Once you’ve worked up an appetite, get yourself to White Duck to scarf some tacos. They offer an amazingly creative array of tacos, from Spicy Buffalo Chicken to Mushroom Potato with Romesco. I tried the Mole Duck with an apple cranberry salsa and the Fish taco. Both were superb. If after your tacos you still have some room, please try the Coconut Macaroon Pie with Salted Caramel for me. Sunny Point Cafe was another new place for us. I fell head over heels in love with this place on our first visit and demanded we go back for a second visit later in the week. I found Sunny Point Cafe via, of all things, Google. The whole Internet seemed to agree that they have the best breakfast in Asheville and I do love a good breakfast. Sunny Point is set up like a ecclectic diner, serving breakfast all day along with locally roasted coffee. Their regular menu covers all the breakfast basics, from eggs to waffles, with lots of vegan/vegetarian options. On our first visit I got the Veggie Omlette with potatoes and a biscuit. The omlette was huge and perfectly cooked, packed with fresh veggies and herbs and super creamy goat cheese. I also really liked the crunchy sugar topping on their biscuits! Make sure you keep an eye out for the daily specials too. On our second visit I got the special Nutella French Toast, made with housemade nutella and bread. It was to. die. for. I’m pretty sure I moaned inappropriately the entire time I was eating it. If you happen to be there on a day they make donuts, I highly recommend those too! PS. Don’t miss the huge garden out back! The Corner Kitchen is an old Asheville favorite of ours. My husband and I first visited during our honeymoon 6 years ago! We had an amazing dinner one night and returned for lunch later that week. We raved about how great it was to everyone we knew. Unfortunately, when we made a return visit a couple of years ago our meal didn’t wow us. We left disappointed and a little sad, thinking one of our favorite restaurants was changed for the worse. However, we decided to give Corner Kitchen a second chance. I’m so glad we did. This time our meal was on par with our first visit and we both left full and happy. I had roasted duck with butternut squash and a cider reduction. I practically licked the plate clean! 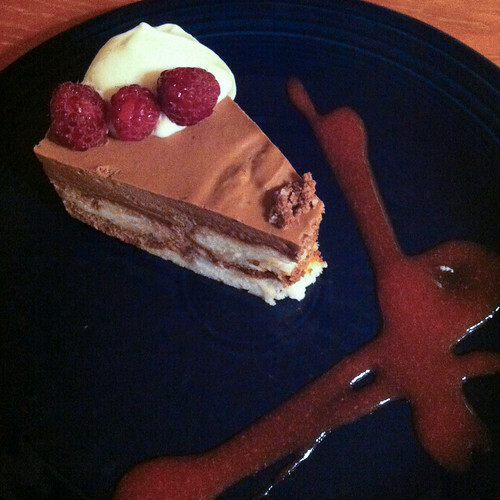 For dessert, I chose the chocolate mouse cake which was both rich and light at the same time. Corner Kitchen is definitely a favorite again! Cùrate (pronounced coo-rah-tey) is a Spanish tapas restaurant. I’m familiar with tapas but have never eaten at a tapas restaurant before. Fortunately the staff was very helpful in explaining things to us and recommending dishes. The great thing about tapas is that they’re small plates meant to share, so you get to try a lot of different foods in one meal. We tried everything from a pizza-type appetizer to chorizo. 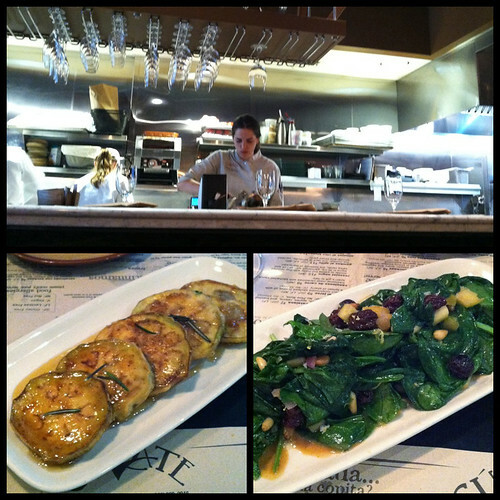 Our favorite was the fried eggplant drizzled with local honey and rosemary. Not a flavor combo I would have thought of, but it was delicious! This was another Asheville hot spot that was recommended several times, so we felt compelled to check it out. Like White Duck Taco Shop, 12 Bones Smokehouse is located in the River Arts District. The location was a little out of the way, and the only hint of the deliciousness inside was the smattering of picnic tables outside and the aroma of smokey sweet barbecue wafting from the building. Oh yeah, and the packed parking lot. We knew we were in the right place when we saw the long lunch line! Fortunately it moved quickly because my mouth was watering. The menu is pretty traditional, with an array of meats smoked low and slow plus all the expected sides, including corn bread. They shake things up a bit with their sauces though. If I remember right, they had 5 to choose from when we visited. 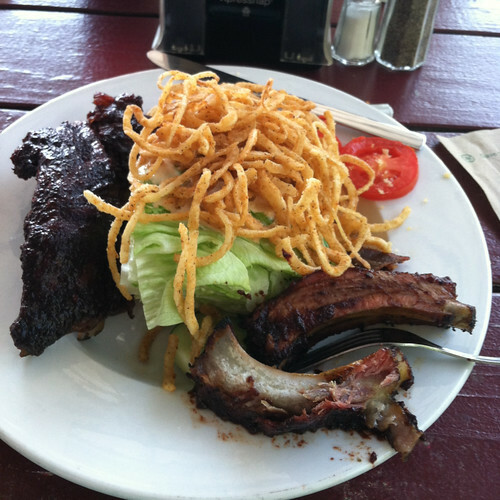 I was in the mood for something lighter and the Wedge Salad caught my eye: a chunk of iceberg lettuce with sugar bacon, tomato, fried onions, cucumbers, and spicy ranch dressing – with ribs, of course. I opted for the blueberry chipotle sauce. The ribs were perfectly tender and I loved the blueberry chipotle sauce so much I bought some to take home with us! As a huge salty-sweet fan, my favorite part of the salad was the sugared bacon. My husband had their traditional pulled pork sandwich and said it was among the best he’s ever had. If you’re a barbecue fan, be sure to stop by! The Chocolate Fetish was our first chocolate shop discovery in Asheville years ago and we’ve been big fans ever since. 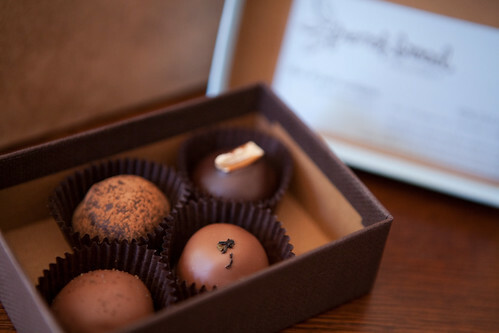 Their handmade truffles are amazing, and I say that as a total truffle-snob. Each truffle is generously sized and expertly crafted. Their knowledgeable employees will describe each truffle to you in painstaking detail if you’d like (they study them – I asked!) and then serve them up to you on (no joke) a silver platter. This time around I tried the Pumpkin Spice truffle and Peanut truffle. Swoon. An old favorite is the uniquely flavored Mid-Summer Dream truffle, featuring lavender, lemon zest and honey. The Chocolate Fetish also offers an assortment of other hand-painted chocolates and chocolate goodies. We’re big fans of their chocolate covered pretzels! If you can’t get to Asheville, you can also order from The Chocolate Fetish online! Lucky you. Asheville is making a name for itself as Chocolate City and I think you can see why. 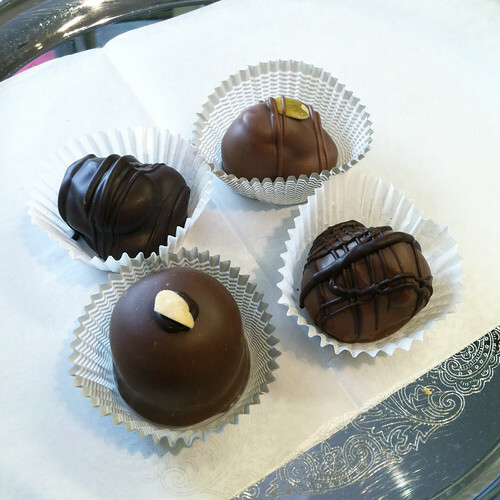 Chocolate Gems is the third handmade chocolate shop we visited in Asheville! In addition to the handmade truffles and chocolate sculptures in their shop, Chocolate Gems also specializes in gelato. After seeing daily gelato flavors like Lemon Meringue and Mascarpone Caramelized Pear on their Facebook Page, I had to check the place out. On the day we visited none of the gelato flavors really jumped out at me, but the affogato caught my eye. 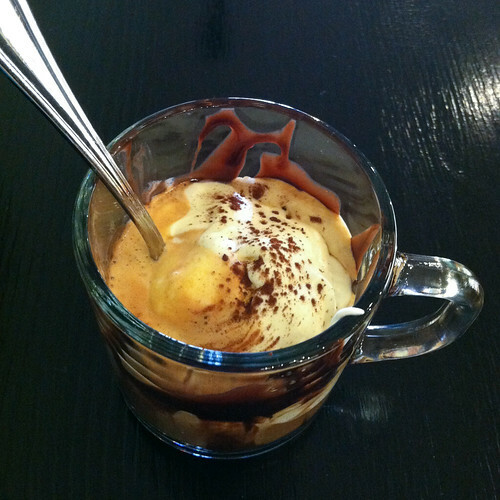 Affogato is vanilla bean gelato, hot espresso, chocolate syrup, and whipped cream in a mug. The gelato and espresso melt together and mix with the chocolate syrup to form a delicious “sauce”. It was a perfect not-too-sweet mid-afternoon treat. So there you have it! My personal food tour of Asheville, NC. There were at least a dozen other restaurants I had hoped to try while we were there, but we found out the hard way that there’s only so much food you can eat in one day, even if it is amazingly great food. 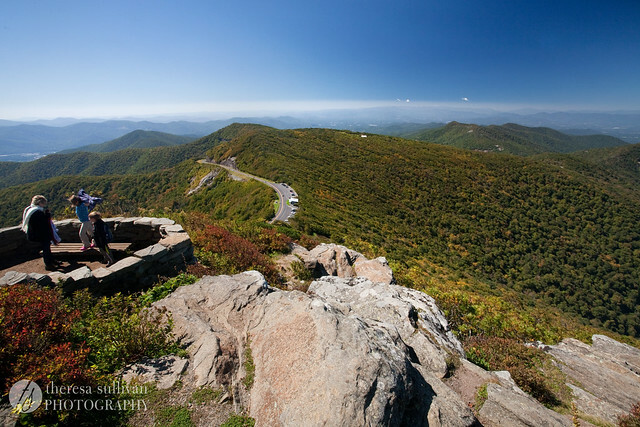 If you ever get a chance to visit, don’t miss the nearby Biltmore, Chimney Rock, North Carolina Arboretum and Blue Ridge Parkway. 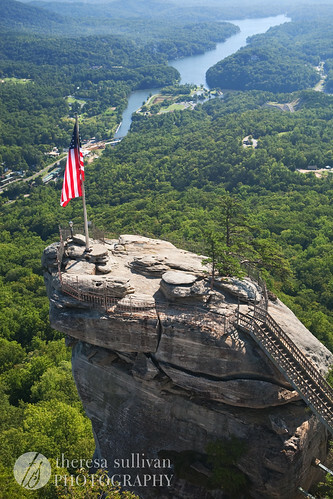 I recommend bringing a pair of hiking boots and hitting the trails to work up an appetite, then stuffing yourself silly with Asheville’s finest culinary delights. Loved reading this! We live an hour from Asheville and look forward to trying your recommendations!! I think I gained a few pounds just reading your post! Big fan of food tourism. Thanks for sharing your recommendations! Oh my god, All of that chocolate… so beautiful! All these places sound awesome! Can’t wait to check them out next month. I think I’m going to extend our stay another day so we have more time there! i live in Asheville…. all favorites of mine… I haven’t tried Corner Kitchen yet. I would add Chai Pani, Salsas, and Battery Park Champagne bar and book exchange.. all fantastic… great list! I am forwarding this to my three girlfriends who are coming to visit at the end of the month! 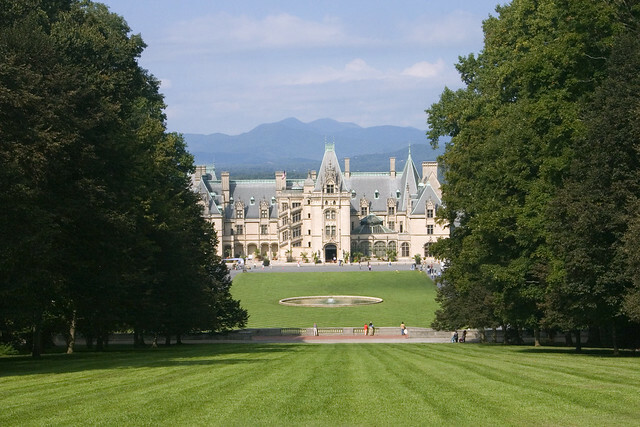 I’m a North Carolina native and have never made my way to Asheville.. Now it’s a must within the next year – I’m definitely bookmarking this for recommendations! Sounds like a wonderful place, and what lovely photographs! These are the kind of blog posts i hang out for! Thank you, thank you, thank you! I live in Australia so who knows if i ever will get a chance to visit (I’m certainly going to try! It sounds great) but i just love reading about people eating food. Yum.